After weeks of seeing “coming soon” signs taped over the McCafe menus, the McDonalds in my area finally started serving their much-hyped espresso drinks. The iced coffee drinks they’ve had on the menu for a while are actually pretty good, not to mention a good value, but this was the first chance I had to try a hot espresso drink from a McCafe in the US (I’ve tried McCafe in other countries before). 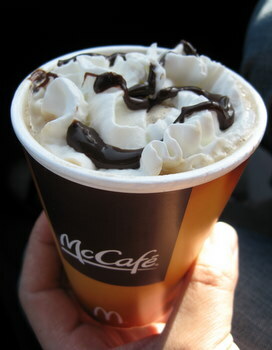 I opted for the mocha. The drink is actually pretty good, although how it stacks up to your favorite coffee shop will depend on what features you like in your mocha. This one is creamy (I ordered it with whole milk, but it comes in a nonfat option), with a lot of not-too-sweet chocolate flavor. The coffee flavor, however is minimal, and there isn’t any foam from steamed milk on the drink. Instead, it’s topped with whipped cream and the same syrup they put on top of hot fudge sundaes. Although the whipped cream melts into the drink quickly, the fudge really is a nice touch. The ingredient list for this drink is surprisingly short – whole milk, espresso, chocolate syrup – but it does have corn syrup as opposed to, say, melted chocolate in it. That said, the chocolate sauce probably isn’t all that different from what you’d find at other coffee shops. In the end, I’d still prefer to have a more heavily coffee-flavored drink, I think that it will find a solid audience with chocoholics and I wouldn’t turn it down if I was in the mood for something very chocolaty with an extra boost of caffeine in it, either.